Um, Crystron Needlefiber? I think you missed your cue. Hello Pojo Readers, Crunch$G back here to tell you what you should know about the first main booster set of 2019, Savage Strike. This set is focused around Synchro Summoning, so you see support for some old Synchro archetypes along with a few new generic Synchros from the anime. Along with the Synchros are some more Fusions for other VRAINS archetypes, more Impcantation support for Ritual decks, added support to many more archetypes, a new World Legacy archetype, some good generic cards, and new TCG exclusive archetype support. The set does have a ton of good cards in it, so let’s get to talking about those great cards. First off, we got the new Cyberse support of the set. Catche Eve L2 can Special Summon herself from your hand by targeting a Level 3 or higher monster you control and reducing its Level by 2. 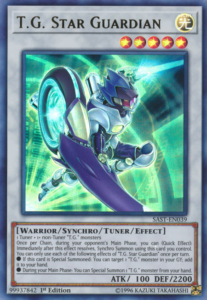 Cyberse Synchron is a Level 1 Tuner that once per turn can target a Level 4 or lower monster you control and have this gain Levels equal to the Level of the targeted monster and if a monster in your Extra Monster Zone would be destroyed by battle or card effect, you can banish Cyberse Synchron from the GY instead. Cyberse Quantum Dragon is a Level 7 Cyberse Synchro requiring just any Tuner and non-Tuners and only Quantun Dragon can be targeted for attacks or card effects from your opponent if you control a Link Monster and when Cyberse Quantum Dragon battles an opponent’s monster, you can return the opponent’s monster to the hand and if you do then Quantum Dragon can make a second attack in a row. 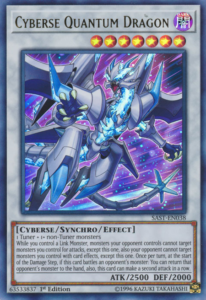 Cyberse Integrator is a Level 3 Cyberse Synchro that requires any Tuner and non-Tuners and when Synchro Summoned can let you target a Cyberse Tuner in your GY and Special Summon it but you can only Special Summon Cyberse monsters for the rest of the turn and when Integrator is sent to the GY and was Synchro Summoned, you can draw 1 card. 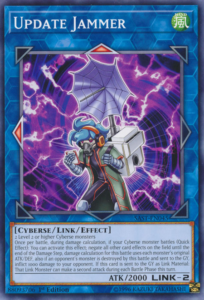 Cyberse Wicckid is a Link-2 with Bottom and Bottom-Right Arrows and if it was Link Summoned then it cannot be destroyed by battle or card effects and Cyberse monsters this card points to cannot be destroyed by card effects, also if a monster is Special Summoned to a zone this card points to while you control it, you can banish a Cyberse monster from your GY to search for a Cyberse Tuner. Update Jammer is a Link-2 with Up and Left arrows and requires any Level 2 or higher Cyberse monsters and when a Cyberse monster you control battles, you can negate the effects of all other cards on the field til the end of the Damage Step and use the original ATK/DEF of the monsters during the damage calculation and if an opponent’s monster is destroyed in battle and sent to the GY then they’ll take 1000 damage, and finally if Update Jammer was sent to the GY as a Link Material then the Link Monster that used it as material can make two attacks during each Battle Phase that turn. 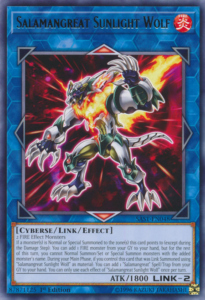 Detonate Deleter is a Link-3 with Left, Right, and Bottom-Left Arrows and requires any 2+ Cyberse monsters and when it battles a face-up monster that isn’t Link-3 or higher then that monster is destroyed and you can tribute a monster Detonate Deleter points to and destroy a monster your opponent controls. 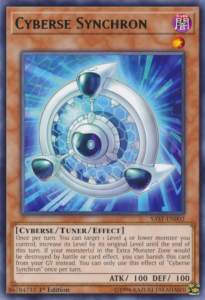 Finally, Clock Lizard is a Link-2 with Bottom-Left and Bottom arrows and requires 2 Cyberse monsters and you can also tribute Clock Lizard to return a Fusion Monster in your GY to the Extra Deck then Fusion Summon that Fusion from the Extra Deck by banishing Fusion Materials from your GY as materials, also if Clock Lizard is banished then you can make all Special Summoned monsters your opponent controls lose 400 ATK by for each Cyberse in your GY. 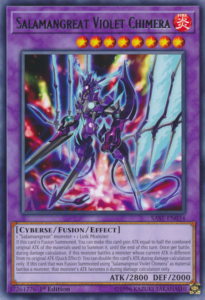 Finally you got Cyberse Converter, which can be Special Summoned if all monsters you control are Cyberse and if Normal Summoned can change the type of a monster you control to Cyberse. 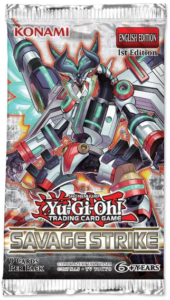 In the last set, Soul Fusion, we saw the debut of the new Cyberse archetype that is Salamangreat, so as expected we got new support in Savage Strike. Wolvie is a Level 4 that when used as Link Material, the monster Link Summoned gets battle and effect destruction protection for the turn, when Wolvie is revived from the GY you get to add back a FIRE monster from your GY to your hand, and if Wolvie is added from your GY to your hand you can reveal it to add a FIRE monster in your GY to your hand. Parro is a Level 5 that can be Special Summoned from your hand when your opponent declares an attack, when Special Summoned can target a Salamangreat monster you control and make this cards ATK the ATK of the targeted monster, and you can tribute Parro to gain 2000 LP. Foxer is a Level 3 that if you have 3 or more Salamangreat monsters in your GY: you can send Foxer from your hand to the GY to target a Salamangreat Link Monster in your GY and a Spell/Trap your opponent controls to return the Link Salamangreat to your Extra Deck and destroy the Spell/Trap and if a Spell/Trap your opponent controls is destroyed and sent to the GY while Foxer is in the GY you can revive the Foxer in Defense Position. Violet Chimera is a Fusion of a Salamangreat monster and a Link Monster and if it is Fusion Summoned it gains the ATK equal to half the ATK of the materials used to summon it until the end of the turn it is Fusion Summoned, if this card battles a monster with ATK different from its original ATK then Violet Chimera will double its own ATK during damage calculation, and finally if Violet Chimera was Fusion Summoned using another Violet Chimera then a monster Violet Chimera battles has its ATK become 0 during damage calculation. Sunlight Wolf is a Link-2 with Up and Down arrows that needs 2 Salamangreat monsters and will grab a FIRE monster from your GY that you can’t use for the rest of that turn if a monster is Normal or Special Summoned to a zone it points to and if Sunlight Wolf was Link Summoned with another Sunlight Wolf then you can target a Salamangreat Spell/Trap in your GY and add it to your hand. 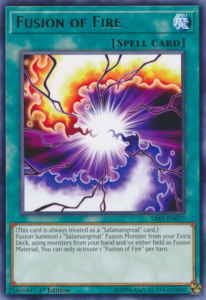 Finally, Fusion of Fire is the archetypal Fusion Spell that can Fusion Summon a Salamangreat using monsters you control or on either side of the field as material and this card is always treated as a Salamangreat card despite the word not being in its name. For the first time since we got Miracle Contact in 2012, the Neo-Spacian archetype got some new pieces of support. 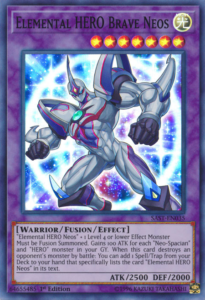 Neo Space Connector was in the Soul Fusion Special Edition, but if you don’t know it already, it is a Level 4 that upon Normal Summon can Special Summon a Neo-Spacian or Elemental HERO Neos from your hand or deck in Defense Position and can also be tributed to revive a Neos or Neo-Spacian from your GY in Defense Position. Elemental HERO Brave Neos is a Level 7 Fusion of Elemental HERO Neos and any Level 4 or lower Effect Monster and it’ll gain 100 ATK for each Neo-Spacian and HERO monster in your GY and when Brave Neos destroys a monster in battle it searches for a Spell or Trap that lists Elemental HERO Neos in its card text. Elemental HERO Cosmo Neos is a Level 11 Fusion of Elemental HERO Neos and any 3 Neo-Spacian monsters with different attributes and must first be Special Summoned by shuffling the Fusion Materials on the field into the deck and when Special Summoned from the Extra Deck you can activate the effect that will prevent your opponent from activating cards or effects while your opponent cannot respond to this effect and during the End Phase your Cosmo Neos will go back to the Extra Deck and destroy all cards your opponent controls. Neos Fusion is a Spell that lets you Special Summon a Fusion Monster from your Extra Deck that lists exactly 2 materials, including Elemental HERO Neos, by sending the Fusion Materials from your hand, field, or deck to the GY and this ignores summoning conditions then for the rest of the turn after Neos Fusion resolves you are locked out of all Special Summons, and secondly when a Fusion Monster that lists Elemental HERO Neos would be destroyed or would return to the Extra Deck via its own effect you can instead banish Neos Fusion. NEXT is a Trap Card that can be activated from the hand if you control no other cards and it lets you Special Summon as many monsters with different names as possible in Defense Position with their effects negated that are Neo-Spacians or Elemental HERO Neos from your hand or GY but while they are on the field you can only Special Summon Fusion Monsters from the Extra Deck. For the first time since their debut in 2011, we get more T.G. support in a set based on Synchro Summoning, so it makes sense. T.G. Screw Serpent is a Level 4 Tuner that when Normal or Special Summoned lets you revive a Level 4 or lower T.G. monster from your GY with its effects negated and you can banish Screw Serpent from your GY to target a T.G. monster you control and increase/reduce its Level by 1 for the turn. T.G. Booster Raptor is a Level 1 that can be Special Summoned from the hand if you control a T.G. monster and during the End Phase if it was destroyed and sent to the GY that turn, you can search for any T.G. monster. T.G. Tank Grub is a Level 1 Tuner that if it is used as a Synchro Material for a T.G. monster, you can treat it as a non-Tuner and if this card is sent to the GY as the Synchro Material for a T.G. Synchro, you can Special Summon a Level 1 T.G. Token with 0/0 stats in Attack Position. T.G. Star Guardian is a Level 5 Synchro Tuner that during your opponent’s Main Phase lets you Synchro Summon using it and other monsters as material, if Star Guardian is Special Summoned you can add a T.G. monster from your GY to your hand, and once per turn Star Guardian will let you Special Summon a T.G. from your hand. T.G. Trident Launcher is a Link-3 that requires 2+ Effect monsters, including a T.G. 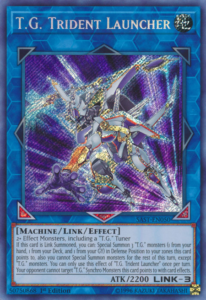 Tuner, and when Link Summoned lets you Special Summon 3 T.G. monsters (one from your hand, deck, and GY) in Defense Position but locks you to T.G. Special Summons for the turn and also Trident Launcher gives T.G. Synchros it points to protection from targeting by your opponent. The next World Legacy archetype comes to us and it is the Guardragon archetype. Guardragon Justicia is a Level 2 Normal Dragon Tuner with 2100 DEF and that’s it. Guardragon Garmides is a Level 3 that can Special Summon itself from the hand if a Normal Monster is sent to the GY and if this card is in your GY then you can send a Dragon from your hand to the GY to add this to your hand. Guardragon Promineses is a Level 1 that can be sent from the hand or field to the GY to boost a Dragon by 500 ATK and DEF until the end of your opponent’s turn and if a Normal Monster is sent to your GY while this card is in your GY, you can Special Summon it but banish it when it leaves the field. Guardragon Andrake is a Level 4 that cannot be Normal Summoned or Set and must be Special Summoned by a card effect, if it is Special Summoned from the hand or deck then you can double this cards ATK and DEF until the end of your opponent’s turn, and if it is Special Summoned from the GY or banished pile then you can target 1 monster your opponent controls and destroy it. Guardragon Elpy is a Link-1 with a Left arrow and requires 1 Level 4 or lower Dragon as material, you cannot Special Summon monsters except Dragons while you control it, you can only Special Summon 1 Elpy per turn, and during your Main Phase you can Special Summon any Dragon from your hand or deck to your zone 2 or more Link Monsters point to. Guardragon Pitsy is a Link-1 with a Right arrow and requires 1 Level 4 or lower Dragon as well, it also locks you to only Special Summoning Dragons while you control it and you can only Special Summon 1 Pitsy per turn, and once per turn during your Main Phase you can Special Summon any Dragon that is banished or in your GY to your zone any 2 or more Link Monsters point to. 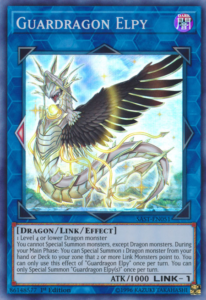 Guardragon Agarpain is a Link-2 with an Up and Down arrow that requires any 2 Dragons, has similar restrictions as Elpy and Pitsy, and during your Main Phase it lets you Special Summon any Dragon from your Extra Deck to your zone 2 or more Link Monsters point to. 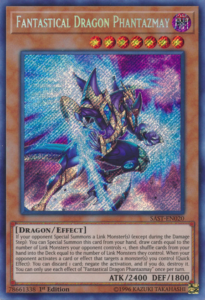 Guardragon Shield is a Field Spell that gives a Dragon you control a 100 ATK/DEF boost for the total Link Ratings on the field until the end of your opponent’s turn and once per turn, if exactly 1 Dragon you control would be destroyed you can instead send a Normal Monster from your hand or deck to the GY instead. 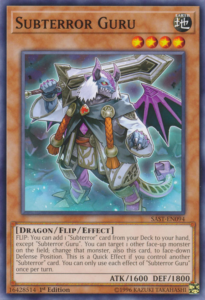 World Legacy Guardragon is a Continuous Spell that can add back to your hand or revive a Level 4 or lower Dragon upon activation and once per turn lets you move a Dragon you control to a different Main Monster Zone on your side of the field. Guardragon Corewakening is a Continuous Trap that lets you send an Effect monster from your hand to the GY to Special Summon a Level 4 or lower Normal Dragon from your hand, deck, or GY in Defense Position. Finally, Guardragon Cataclysm is a Normal Trap that lets you tribute 1 Dragon you control to target 2 cards on the field an destroy them. 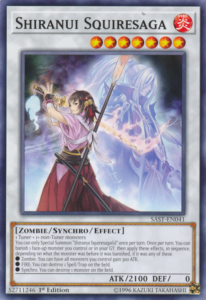 Making their return in the Synchro Set is the Zombie Synchro Archetype known as Shiranui. Shiranui Spectralsword Shade is a Level 3 Tuner that can be tributed to target 2 banished Zombies, including a Shiranui, and Special Summon them in Defense Position with negated effects and you are locked to Special Summoning Zombies for the rest of the turn. 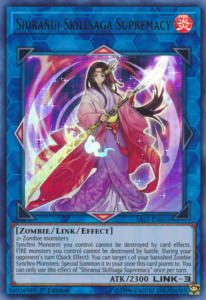 Shiranui Swordmaster is a Level 2 that can be Special Summoned from the GY while you control 2 or more Shiranui monsters, but it is banished when it leaves the field, and when it is banished you can target a Zombie you control and give it 600 ATK until the end of this turn. Shiranui Squire is a Level 1 that when Normal Summoned lets you Special Summon a Shiranui Spectralsword monster from your hand or deck but you are locked to Special Summoning Zombies for the rest of the turn and if Squire is banished, you can draw 1 card then discard 1 card. Shiranui Swordsaga is a Level 5 Synchro requiring 1 Tuner and 1+ non-Tuners, can only be Special Summoned once per turn, if Special Summoned lets you target a monster on the field and change its battle position, and if banished lets you Special Summon a Level 1 Zombie FIRE Shiranui Token with 0/0 stats. Shiranui Squiresaga is a Level 7 Synchro that requires a Tuner and 1+ non-Tuners, can only be Special Summoned once per turn, and can let you banish a monster on your field or in your GY to apply the following effects in sequence based on what monster it was: Zombie boosts all your monsters by 300 ATK, FIRE lets you destroy a Spell/Trap on the field, and Synchro lets you destroy a monster on the field. Shiranui Skillsaga Supremacy is a Link-3 with Up, Left, and Bottom arrows and requires any 2+ Zombies as materials and she gives your Synchro Monsters protection from destruction effects and FIRE monsters protection from battle destruction and finally during your opponent’s turn you can target one of your banished Synchro monsters and Special Summon it to a zone this card points to. 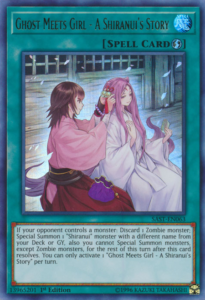 Ghost Meets Girl – A Shiranui’s Story is a Quick-Play Spell that if your opponent controls a monster, you can discard a Zombie monster to Special Summon a Shiranui monster from your deck with a different name and you are locked to Special Summoning Zombies for the rest of that turn. Shiranui Style Solemnity is a Continuous Spell that is treated as Shiranui Style Synthesis while on the field and once per turn you can activate one of two effects: one lets you banish a Zombie from your GY to prevent the summons of your Zombies to be unable to be negated and the other lets you banish a Zombie you control to send a Zombie with 0 DEF from the deck to the GY. Finally, Shiranui Style Success is a Normal Trap that lets you Special Summon a Zombie from your hand and it is banished when it leaves the field, also you can banish Success from the GY to target a Zombie you control and it is unaffected by other card effects that isn’t its own. It’s been a bit, but we got some new Trickstar support. Trickstar Band Sweet Guitar is a Level 7 Fusion of a Trickstar Link monster and a Trickstar monster, she doubles the effect damage dealt by a Trickstar Link Monster that is Linked to this card, if your opponent takes damage by a Trickstar effect then this card gains ATK equal to the damage dealt, and once per turn during the End Phase of the turn this card battled, the ATK boost from this card’s effect becomes 0 then you can add a Trickstar monster from your GY to your hand. 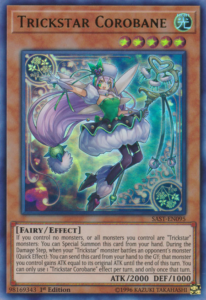 Trickstar Divaridis is a Link-2 with Bottom-Left and Bottom arrows and needs any 2 Level 3 or lower Trickstars, you can only control 1 Divardis, and she deals 200 damage when she is Special Summoned and when your opponent Normal or Special Summons a monster. 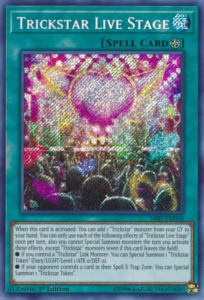 Trickstar Live Stage is a Field Spell that adds a Trickstar from your GY to your hand upon activation and has two effects you can use once per turn, but you are locked to Special Summoning Trickstars that turn: if you control a Trickstar Link Monster then you can Special Summon a Level 1 Trickstar Token and if your opponent controls a card in their Spell/Trap Zone you can Special Summon a similar Trickstar Token. 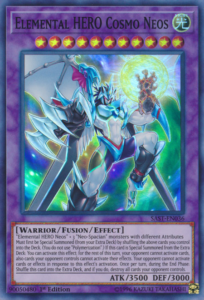 Trickstar Fusion is the archetypal Fusion Spell that Fusion Summons a Trickstar using monsters from your hand or field as material and you can banish this card from the GY to target a Trickstar monster in your GY and add it to your hand, but you cannot Summon monsters with the same name as that monster for the rest of that turn. Finally, Trickstar Corobane is a Level 5 that can be Special Summoned from your hand if you control no monsters or if all monsters you control are Trickstars and during the Damage Step which a Trickstar monster battles an opponent’s monster, you can send Corobane from your hand to the GY to let your Trickstar gain ATK equal to its original ATK until the end of the turn. Instead of getting a ton of new Danger! monsters, we got a new TCG exclusive archetype in Time Thieves, full of Level 4 monsters and their own Rank 4. Time Thief Wander can detach a Xyz Material from an Xyz you control to be Special Summoned from the hand and when summoned lets you search for any Time Thief card that isn’t another Winder. Time Thief Bezel Ship can tribute itself during either player’s turn to target a Time Thief Xyz you control and attach a card from your opponent’s GY to it as material and if Bezel Ship is in your GY, you can detach a material from an Xyz you control to Special Summon it from the GY but banish it when it leaves the field. 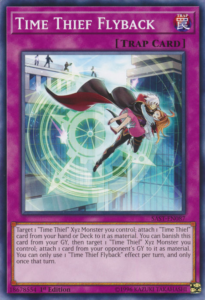 Time Thief Regulator can tribute itself if you control no other monsters to Special Summon two Time Thieves from your deck in Defense Position with different names and if an Xyz monster you control is destroyed by battle while this card is in your GY, you can Special Summon this card from your GY but banish it when it leaves the field. Time Thief Redoer is a Rank 4 of any 2 Level 4 monsters, once per turn during either player’s Standby Phase lets you attach the top card of your opponent’s deck to this card as material, and can detach any different types of materials (Monster, Spell, Trap) and gain various effects based on what was detached: Monster lets you banish this monster until the End Phase, Spell lets you draw a card, and Trap lets you put a face-up card your opponent controls on top of their deck. Time Thief Hack is a Continuous Spell that gives your Xyz monsters protection from targeting and destruction effects the turn it is summoned and can also boost an Xyz monster you control once per turn by 300 ATK for each material it has and if it has a material owned by your opponent then it can attack directly that turn. Finally, Time Thief Flyback is a Normal Trap that attaches a Time Thief card from your deck to a Time Thief Xyz you control and can be banished from the GY to attach a card from your opponent’s GY to a Time Thief Xyz you control. Shadows in Valhalla isn’t the only time Valkyries get new cards, as they got more support in Savage Strike. 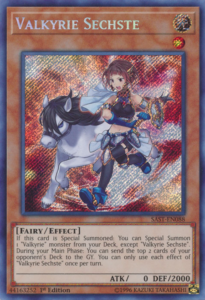 Valkyrie Sechste is a Level 1 that lets you Special Summon a Valkyrie from the deck when she is Special Summoned and once per turn during your Main Phase can make your opponent send the top 2 cards from their deck to the GY. Valkyrie Vierte is a Level 3 that lets you excavate the top cards of your deck equal to the number of other Valkyries you control and if you do you can add a Normal Spell/Trap excavated to your hand and send the other cards to your GY, otherwise shuffle the excavated cards into the deck, and also when Vierte is destroyed by battle and sent to the GY you can Special Summon a Valkyrie from the deck. Final Light is a Normal Spell that lets you pay LP in multiples of 1000 to revive a Valkyrie from your GY with a different name for each multiple of 1000 paid and then your opponent can Special Summon 1 monster with 2000 or less ATK from the GY up to the number of monsters you Special Summoned. Finally, Apple of Enlightenment is a Normal Trap that lets you banish cards from your opponent’s GY up to the number of Valkyries you control and if this set cards leaves the field because of your opponent then you can draw cards equal to the number of Valkyrie monsters you control +1. There are also support cards in here for other archetypes, even though they got like one or two new cards. Danger! Ogopogo! is a Level 8 that does what all the other Danger! monsters do and when Ogopogo! is discarded, you can send a Danger! card from the deck to the GY. Speedburst Dragon is a Level 6 that can be Special Summoned from the hand when you take burn damage and burns the opponent for the same amount, but if it is Tribute Summoned then you can add 2 Rokket monsters with different names from your deck to your hand. 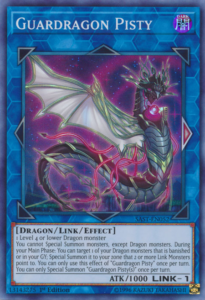 Rokket Synchron is a Level 1 Tuner that can revive a Level 5 or higher DARK Dragon in Defense Postion upon Normal Summon, but its effects are negated, it is destroyed during the End Phase, and you cannot Special Summon monsters from the Extra Deck for the rest of the turn except for DARK monsters. 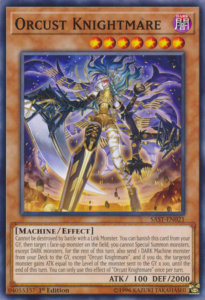 Orcust Knightmare is a Level 7 that cannot be destroyed in battle by a Link Monster and can be banished from the GY, you cannot Special Summon for the rest of the turn except DARK monsters, and then you can send a DARK Machine from your deck to the GY except another Orcust Knightmare and a monster you targeted by this effect gains 100 ATK x the Level of the sent monster until the end of the turn. 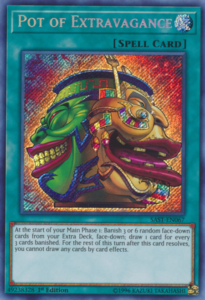 Prank-Kids Rocksies is a Level 4 that when used as a Fusion/Link Material for a Prank-Kids, you can banish a card from your hand to draw a card and then Special Summon a differently named Prank-Kids from the deck. 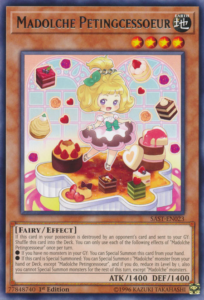 Madolche Petingcessoeur is a Level 4 that can be Special Summoned from your hand if you have no monsters in your GY, when Special Summoned lets you Special Summon a differently named Madolche from your hand or deck and lower its Level by 1 but you are locked to Madolche summons for the turn, and if it is destroyed while in your possession and sent to the GY then it is shuffled into the deck. Impcantation Chalislime is a Level 7 Ritual that uses Impcantation Inception for its Ritual Spell, you can reveal Chalislime from your hand and discard a card to Special Summon an Impcantation from your deck and during the End Phase you lose 2500 LP if you did not Ritual Summon after this, and while you control this card then you can send an Impcantation in your hand or face-up on your field to target a monster your opponent controls and destroy it. Sky Striker Ace – Kaina is a Link-1 that requires any non-EARTH Sky Striker Ace, if Special Summoned lets you target an opponent’s monster and it cannot attack until the end of the opponent’s turn, gains you 100 LP after a Sky Striker Spell activates and resolves, and you can only Special Summon 1 Kaina per turn. Impcantation Inception is a Ritual Spell that lets you Ritual Summon any Ritual Monster by tributing Impcantation monsters in your hand or on your field with Levels that equal or exceed the Ritual Monster’s Level, and if this card is in your GY then you can send an Impcantation you control or in your hand to the GY to Special Summon an Impcantation from your deck and then add this card to your hand. Super Anti-Kaiju War Machine Mecha-Thunder-King is a Level 9 that during the Main Phase you can discard this card and banish a Kaiju you control that is owned by your opponent to then Special Summon a monster from your GY, you can only control 1 Kaiju if this card is on the field, is unaffected by other Kaiju monster’s effects and can’t be destroyed by battle with a Kaiju monster, and during your End Phase if this card is in your GY you can Special Summon it (the last effect is Once Per Duel). Legendary Secret of the Six Samurai can be Special Summoned from your hand when your Normal or Special Summon a Six Samurai and it can let you banish a Six Samurai from your GY to change this cards ATK/DEF, Level, and Attribute to that monster’s. Subterror Guru is a Level 4 Flip Monster that searches for a Subterror card upon being Flipped excluding another Guru and also you can target another face-up monster on the field and set that monster and this card (this effect becomes a Quick Effect if you control another face-up Subterror card). Super Armored Robot Armed Black Iron “C” is a Level 8 that can be Special Summoned from the hand if you have 3 Insect monsters with the same name in your GY and you can equip said monsters to this card upon summon and you can send a monster equipped to this card to the GY to destroy all monsters your opponent controls with ATK greater than or equal to the ATK of the sent monster. Shinobi Necro is a Level 2 Zombie Tuner that lets you draw a card and discard a card if you Special Summon a Zombie while you control this monster and if it is banished to activate a card effect, or by a card effect, you can Special Summon it but it is banished when it leaves the field. 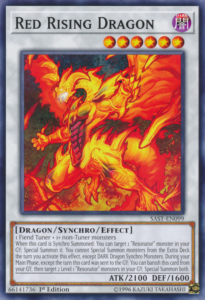 Finally, Red Rising Dragon is a Level 6 Synchro needing a Fiend Tuner and any 1+ non-Tuners and when Synchro Summoned lets you revive a Resonator monster from your GY, but you cannot Special Summon from the Extra Deck the turn you activate this effect except for DARK Dragons, and you can banish Red Rising Dragon from the GY to Special Summon 2 Level 1 Resonators in your GY. Not only did we get a lot of archetype support, but some cards useful in multiple decks came in this set. Fantastical Dragon Phantazmay is a Level 7 that can be Special Summoned from the hand when your opponent Special Summons a Link Monster and then lets you draw cards equal to the number of Link Monsters your opponent controls +1 and put cards back from your hand to the deck equal to the number of Link Monsters your opponent controls, and if your opponent activates a card or effect that targets a monster you control, you can discard 1 card to negate the activation and destroy that card. 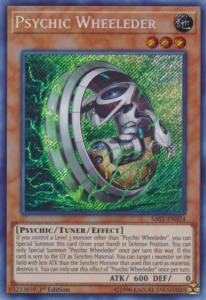 Psychic Wheeleder is a Level 3 Tuner that can be Special Summoned from the hand if you control a Level 3 monster that isn’t Psychic Wheeleder and if it is used as a Synchro Material then you can target a monster with ATK less than that Synchro and destroy it. 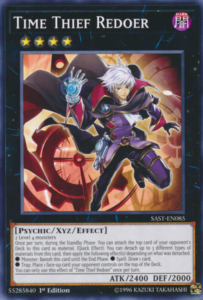 Psychic Tracker is a Level 3 that can also be Special Summoned from the hand if you control a Level 3 that isn’t Tracker and gives a Synchro that uses this as material 600 ATK, but this card isn’t a Tuner. Thunderclap Monk is a Level 4 that can tribute itself if it was Special Summoned to negate the activation of an opponent’s monster’s effect and destroy it and if Monk is sent to the GY you can Special Summon a Thunder from your hand in Defense Position. 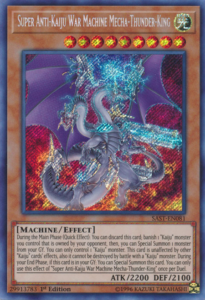 Lappis Dragon is a Level 5 Tuner that can be Special Summoned if added from the deck to the hand by a card effect or can be Special Summoned if added from the GY to the hand by a card effect, but banish it if the latter happens. Cataclysmic Scorching Sunburner is a Level 8 that can be Special Summoned from the hand if a FIRE monster(s) is destroyed by battle or an opponent’s card effect then burns the opponent for half the ATK of one of the destroyed FIRE monsters. 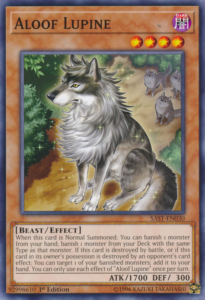 Aloof Lupine when Normal Summoned lets you banish a monster from your hand to then banish a monster in your deck with the same Type and if it is destroyed by battle or it in its owner’s possession is destroyed by an opponent’s card effect, you can add 1 of your banished monsters to your hand. Borreload Savage Dragon is a Level 8 Synchro that needs 1 Tuner and any 1+ non-Tuner and when Synchro Summoned lets you equip a Link Monster from your GY to this card and it gains Borrel Counters equal to the Link Rating of the Link Monster equipped via this effect, it also gains half the ATK of the monster equipped to it by its effect, and during either player’s turn when your opponent activates a card or effect, you can remove a Borrel Counter from this monster once per turn to negate the activation. 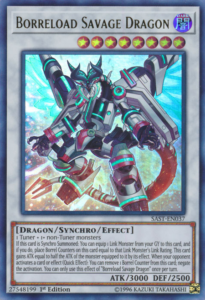 It is worth noting that Cyberse Quantum Dragon does qualify as a generic card, but it fitted in with the Cyberse support as well, so refer to that section for what it does. Hyper Psychic Riser is a Level 6 Synchro needing 1 Tuner and 1+ non-Tuners and prevents monsters with less ATK than it from attacking and monsters with more ATK than it from activating effects (original ATK is 2000) and when Riser is destroyed in your possession by your opponent’s card and sent to the GY, you can target 1 Tuner and 1 non-Tuner with the same Type and Attribute and add them to your hand. Hiita the Fire Charmer, Ablaze is a Link-2 with Bottom-Left and Bottom-Right requiring any 2 monsters including 1 FIRE monster, is always treated as a Familiar-Possessed, lets you target a FIRE monster in your opponent’s GY and Special Summon it to a zone this card points to, and if it is destroyed by battle or an opponent’s card effect you can add a FIRE monster with 1500 or less DEF from your deck to your hand. 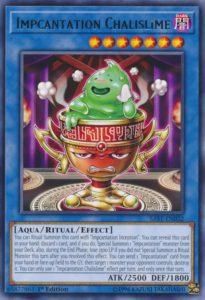 Pot of Extravagance is a Normal Spell that can only be activated at the start of the Main Phase 1, lets you banish 3 or 6 cards face-down from your Extra Deck at random to draw cards equal to each 3 cards banished, and locks you from drawing any other cards after it resolves. Fateful Hour is a Normal Trap that can revive a monster that cannot be Normal Summoned or Set. Dark Factory of More Production can let you send a monster from your hand or field to the GY to draw 1 card. Finally, Witch’s Strike is a Normal Trap that can be activated when your opponent negates the Normal or Special Summon of a monster or the activation of a card or effect and in turn destroys all cards your opponent controls and in their hand. The rarities were a problem that did split the community, and it kinda does hurt the value of buying sealed product when there are poor rarity choices, but that isn’t a discussion I’ll really get into besides that little piece. The quality of cards in here are really good. There are some really nice Cyberse cards in here, especially Cyberse Quantum Dragon for any deck that can make a Level 7 Synchro. Salamangreat get their final support before the Structure Deck they get makes them meta, and Sunlight Wolf will be a big addition along with maybe Violet Chimera and Fusion of Fire. The Neos archetype finally has somewhat of a play strategy that is easy to do actually, so it is finally a viable deck. T.G. 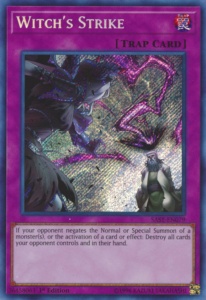 finally becomes the Synchro Spam archetype Konami initially wanted it to be. 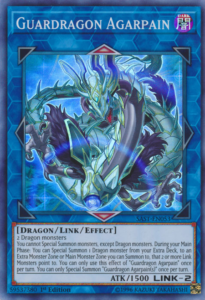 The Guardragons are going to be great for Dragon decks going forward, especially the three Link Monsters. Shiranui got a few good cards, especially with Ghost Meets Girl – A Shiranui’s Story. Trickstars seem to be going in a more Link-centric way of playing, though Corobane helps the variant that is already meta relevant now that it is imported over here. Time Thieves seem like they have a ton of potential and them all being commons is nice. Valkyries do have some restrictions, but the deck is getting better with the new support. There are a ton of good support cards for many archetypes like Orcust (who is going to become meta relevant next set), Madolche (who has a new Rank 4 next set), Impcantation (more support next set as well), Subterror, Danger!, Rokket, and Resonators. That new anti Kaiju can be nice against people using Kaijus against you, which might be more common after the recent Forbidden and Limited List. Fantastical Dragon will be a good side deck option against many Link Spam decks. Psychic Wheeleder might be useful in Level 3 heavy decks, though Psychic Tracker can be a budget replacement if you don’t need the Tuner aspect. Borreload Savage Dragon is going to be a great Synchro for decks building boards full of negates. Aloof Lupine will help decks like Thunder Dragons. Pot of Extravagance is going to be amazing in decks that don’t need their Extra Deck that bad. Witch’s Strike will also be a nice option against decks that are heavy with negation. There are a ton of good cards in here. Sure, the imports could of been better with many Link Monsters from Link VRAINS Packs that could of been in here that are Synchro related like Cyrston Needlefiber for Crystrons and many other decks along with more archetype specific Links like the ones for Dragunities, Speedroids, or Scraps, but I’m sure all of those will come in due time. The quality of cards in here are strong, and it is debatable on how good the rarity spread is. It is most certainly worth having some of the cards in this set.